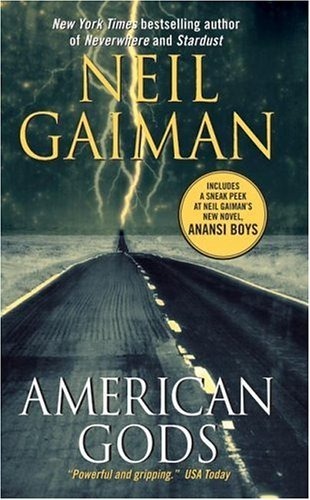 I had no idea what Neil Gaiman’s American Gods was about when I picked it up at the local library a couple of weeks ago. I didn’t even bother reading the cover before I brought it home. I had added it to my ‘must read list’ earlier this year when it came in at #10 on NPR’s list of top 100 Science Fiction/Fantasy Books of all time. When I saw the book on the shelf at the library, it practically leapt into my hands. Not knowing the topic of a book, or the style of the author, can lead to an interesting experience in those first few minutes of reading. I was just coming off reading C.C. Humphrey’s wonderful (but disturbing) book Vlad, The Last Confession, and I was ready for something light – something I could read in a couple of days. American Gods, at 588 pages, is not light in weight, nor in words. This is literary fantasy, so you know you’re going to have to work to get it – to get all of it. But the book has a good, strong hook, and pulled me in before I realized I wasn’t reading something fluffy. Shadow has recently been released from prison early due to the death of his wife. On his way back to his home town for the funeral, he meets a man who knows him all-too well, and seems to always be one step ahead of him on his journey. At first aggravated by this, then irresistibly pulled in by this man, Shadow soon finds himself dropped into the middle of the battle to end all battles, where gods themselves tremble in fear. As the book started, I tried to figure out what I had read that was similar to this. I can think of two stories that come close: Richard Kadrey’s Sandman Slim, and Stephen King’s The Gunslinger. Kadrey’s book is more… ruthless… and King’s epic series, is , well, more epic, given the fact that it’s seven books, not one. If you liked either of those works, you should like American Gods. As I said, this book is literary fantasy, which means that it is not always an easy read. The pace is lot slower in this type of work than say, in a John Scalzi book. There are long paragraphs of description and irregular prose… words and sentence structure there more for the artistic effect than for the story. That’s not a bad thing. It’s definitely not what I write, and I noticed it a lot more because I am editing one of my stories right now. I have to be hyper-conscious of not doing some of the things that Gaiman can do because of the type of book this is. In one memorable section, I saw back-to-back sentences with 130+ words. They are there for effect, and I understand the effect he was looking for, but in the style of story I write, those practices would be far more jarring to the reader and would likely be trimmed at an early edit. If you are a hard-core fantasy or sci-fi reader, this book should be on your list. It’s a good book, with interesting characters, and it held my attention. It’s definitely not what I would call an easy read, but it is worthwhile, and a good book to curl up with on a cold, winter evening. Hi Joe. I enjoyed reading your review, especially the analysis of literary fantasy. That’s not a genre that I normally read, but your review has me considering reading this book.